The Desert Willow (Chilopsis linearis) is a favorite of Phoenix-area homeowners because of its gorgeous spring blooms and tendency to grow fast. The flowers, in varying shades and depths of pink, are fragrant and their trumpet shape attracts hummingbirds. The Desert Willow has plenty of other good qualities. It thrives in sun, is native to the Southwest and needs little water. If you prefer a single trunk and tree-like canopy, Desert Willow can be pruned to that shape, or pruned to have multiple trunks and more of a large shrub appearance. This is an easy tree to care for, and one of the only concerns is to avoid giving the tree too much water. Now, that's a perfect desert tree! The Chitalpa (Chitalpa tashkentensis) is a cross between the Desert Willow and Catalpa. The trees get their slender leaves and drought tolerance from the Desert Willow side, but Chitalpas can withstand slightly colder temperatures than a Desert Willow. Chitalpa trees grow quickly, up to at least 25 feet high. The trees bloom in late spring through summer with large trumpet-shaped, pink-lavender flowers. Although it can handle drought, the Chitalpa needs a little more water in the heat of summer than its Desert Willow cousin. You also can grow Chitalpa as a multi-trunk tree for a more natural effect or as a traditional single-trunk tree. Chitalpas and Desert Willows drop their leaves in winter, so the trees provide shade in summer but let the sun through to your house or patio in winter. If it's an evergreen you're after, try a Texas Mountain Laurel (Sophora secundiflora). This native of Texas and parts of New Mexico is adapted to thrive in the full sun and high temperatures of the low desert. The Mountain Laurel grows more slowly than some trees and typically reaches a mature height of about 8 to 15 feet. Each spring, the tree blooms with gorgeous clusters of purple flowers, similar to those of a wisteria vine. The fragrant clusters smell like a grape soda. Texas Mountain Laurels are drought tolerant and drop few to no leaves or other debris onto your patio or into your pool. The Sweet Acacia (Acacia smallii or Vachellia farnesiana) is a small tree with feathery leaves that are semi-evergreen. The acacia tree can retain some of its foliage in winter and will drop seed pods after flowering. The best feature of the Sweet Acacia is its early spring reward of fragrant yellow flowers. This is an excellent tree for attracting bees and butterflies to the garden early in the season. Sweet Acacias need full sun but little to no watering once a tree is established. The Sweet Acacia is ideal as a background small tree or large shrub in your xeric landscape. The Arizona state tree, Blue Palo Verde (Parkinsonia florida), is renowned for its green-tinted trunk. The trunk and branches are green because they do some of the work normally taken on by foliage (photosynthesis) to give the tree energy. That results in small, delicate leaves and superb drought tolerance, although the tree might drop its leaves during extreme drought. The native Blue Palo Verde is one of the earliest spring bloomers in Phoenix, with masses of bright yellow flowers, and the tree’s canopy is a favorite nesting site for hummingbirds. When summer monsoons hit, the Blue Palo Verde's leaves turn a bluish-green color. This Palo Verde is a rapid grower, reaching up to about 25 feet in height. 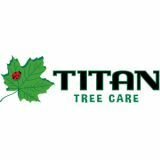 Contact Titan Tree Care and let our team of professionals get your yard ready for spring!